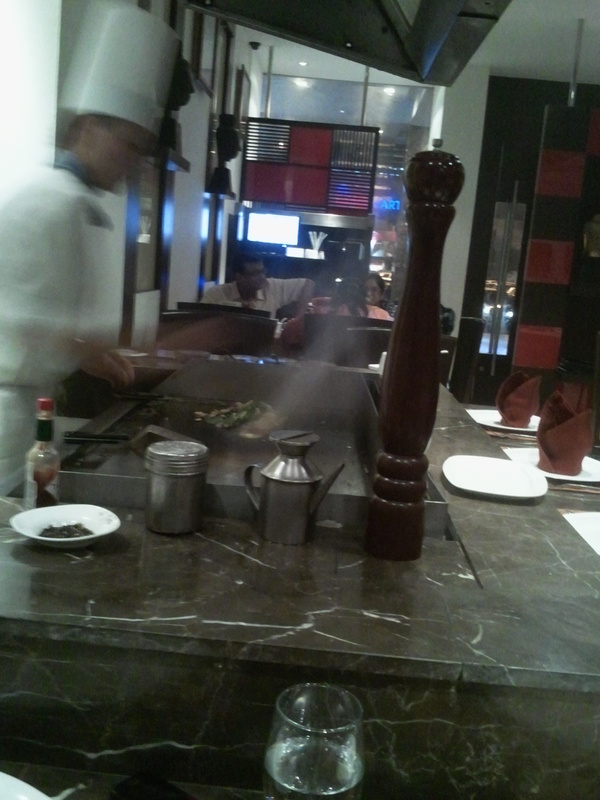 Cuisine type: Both Vegetarian & Nonvegetarian but cooked on teh same Teppan in front of u. If u r passionate about food & cooking, u wud love this place – a live interactive grill where the Chef discussed with u & serves according to ur taste. U can surely choose from the options the Chef gives. We loved the chicken salt & pepper , liked the chicken in 5 spice, Lamb chilli sweet bean, super loved the fish in garlic sauce , highly appreciated the Chicken in black bean sauce & finally tailormade a coooool fish. The dessert was excellent. Overall – a good place to have a cool hearty dinner. I am giving ‘Good’ (not ‘very good’) ranking to this restaurant coz my lamb & fish cud have been better. For chicken lovers, I guess this place is just toooooooo good. When we heard that there is a new grubbery in Gurgaon that serves Japanese teppanyaki, we paid a visit & here goes the story………. So we walk into the restaurant at 10.00 pm & figure out that it is already quite popular & all seats r booked. The manager was however nice & tried to accommodate us & finally was able to. For the uninitiated, the Japanese teppanyaki concept is – chef cooks meats & veggies on a flat hot rectangular metal plate. Customers sit around the live cooking counter & eat. It is interactive & u can get the food made according to ur choice. The teppanyaki counter is right in the middle of the eating hall – For strict vegetarians it might turn out to be a bad experience in case they cannot bear the smell of burnt meat. There are two menu options – veg & non veg & one can have unlimited food sitting at the counter – served right out of the teppan. The chef started off by asking us whether we like spicy or non spicy – we said any amount of spice is ok as long as it tastes good – First he made chicken salt & pepper – shredded pieces of chicken sauteed in asparagus, whole fresh black pepper, shredded dry red chillies & minced onion plant. The result was yummy, soft & juicy, hot & spicy chicken…… inspite of the fact that I am not a big fan of chicken. Then came chicken in 5 spice – We saw him using several spices & sauces – The result was tasty but very Chindian or shud I say Japadian. I doubt that the Japanese have this dish this way. Lamb chilli sweet bean sauce came third & inspite of us generally preferring lamb to chicken, the chicken salt & pepper tasted much better than this. Fourth came fish in garlic sauce – awesome overall – inch size nuggets of fish sauteed in garlic sauce – the only minute negative point being in some of the pieces the cornflour marination coating cud be felt while eating……. Cud b avoided. Chicken in black bean sauce was very good. The last round we got it made according to our choice – went for lots garlic , fish, pokchoy, bean sprouts, butter & full black pepper …..this ended up becoming the show stopper. Try this option out if u sit at the teppanyaki counter & u wud love it. Little housekeeping issues – While the manager was very effective, the staff were at times very forgetful – we waited long for water to be refilled & the Chinese tea was never served inspite of two requests!!!! 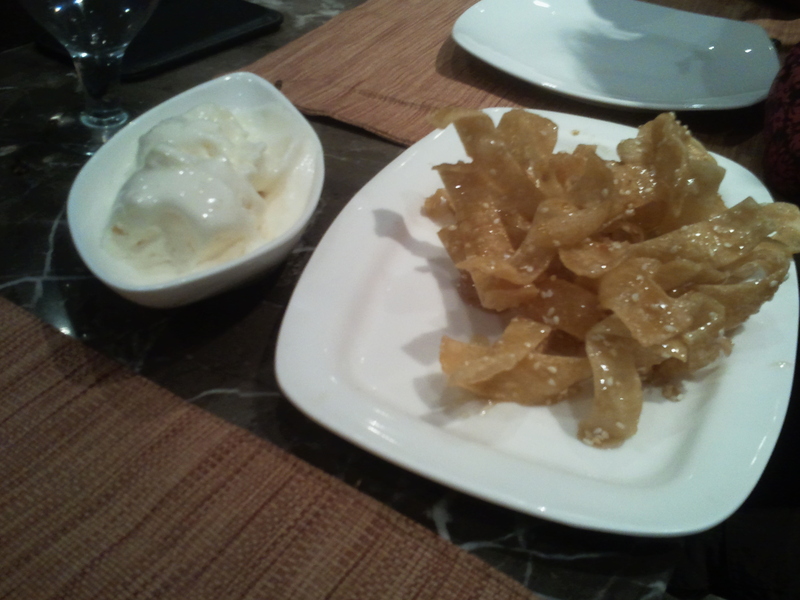 They also serve a lot of ala carte options served at the table which we r yet to try out.